Our bodies and minds are naturally designed to serve us throughout our lives. But if we treat it poorly, much like a car (except irreplaceable), its lifespan will be shortened. We must be sure to nourish our body and mind. Note: If you wish to jump straight to the yoga poses to skip the intro, just click here. When we get enough rest, drink plenty of fluids, eat healthy whole foods, allow emotions to flow naturally, and keep stress levels low, we can more easily deal with the challenges life presents to us on a daily basis. In reality, most of us do not eat an ideal diet free of processed foods and rich in organic fresh fruits, vegetables, hormone-free fish and meat, and whole grains. Many of us do not drink the eight 8-ounce glasses of fluid recommended by the Institute of Medicine. Another unhealthy habit is how we deal with emotions. Some of us may have learned to block emotions and shut down rather than accept them for what they are, so we stick to negative patterns or become numb. I would bet that not one of you reading this could claim you consistently stick to all of these healthy behaviors. Despite my attempts to live a healthy life, far from perfect in regards to this ideal too. While the body is designed to naturally remove toxins that enter through the air we breathe, food we ingest, and experiences we face, today’s overwhelming pace of life and frequent ongoing stress make it difficult for the body and mind to do what they were designed to do. What is Detoxification & How Does Our Body Detox? Detoxification is the body’s natural process of neutralizing or clearing out unwanted toxins. The liver, kidney, colon, lungs, skin, and lymph system all play essential roles in this process. As the major detoxifier of the body, the liver removes harmful substances we ingest, including food additives, harmful minerals, toxic medication, and excess hormones. The kidneys filter out excess salt and waste from cell metabolism, in addition to regulating water fluid levels. The colon, also known as the large intestine, rids the body of leftovers from digestion in the form of solid waste (feces). Through exhalation, the lungs rid the body of carbon dioxide (a byproduct of breathing). 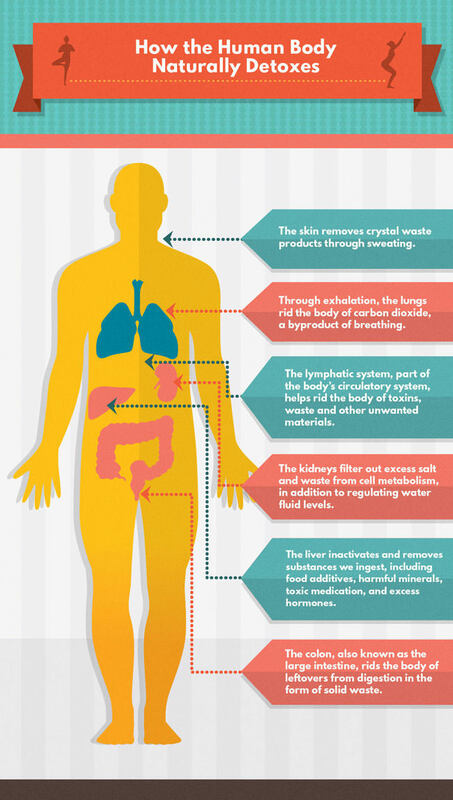 The body’s largest organ, the skin, removes crystal waste products through sweating. Finally, the lymphatic system, part of the body’s circulatory system, helps rid the body of toxins, waste, and other unwanted materials with the help of white blood cells. 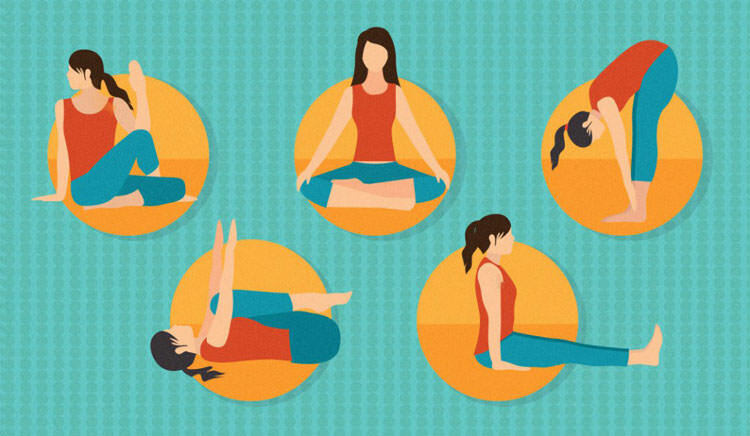 Yoga, an ancient system of pranayama (breathing exercises), asana (postures), and meditation (mindfulness) can aid the body and mind to cleanse both physical and emotional excess. Yoga detoxifies both physical and spiritual (energetic) toxins. Flow through the following asanas to promote detoxification of mind, body, and emotions. When completing the following postures, breathe deeply through the nostrils and keep the breath smooth and flowing. If this particular topic interests you, try this yoga detox book to learn more and get better results. It got incredible ratings, so give it a try! This is another great yoga pose that can be added to your routine for detoxing your body. This asana massages all the organs of digestion and elimination, including the kidney, liver, colon, and spleen, which is part of the lymph system. Sit with the legs extended, hands resting on the floor at your sides. Feel the bones of the pelvis connect down to the earth and lengthen through the spine, from the tailbone to the crown of the head. Bend the left knee and place the sole of the left foot to the inside of the right thigh. Tuck the right foot under the buttocks. Wrap the right arm around the left knee and pull the belly to the left with the left hand. Bring the left hand around behind you and place it near the buttocks. On an exhale, begin to twist deeper to the left first in the belly, then the chest, the neck, and the eyes. On the inhale, gently lengthen more from the tailbone to the crown of the head. Take several deep breaths, deepening your awareness into the sensations provided by the pose. To release, inhale the left arm to shoulder height and draw it forward, gently straighten the legs and shake them before repeating the twist to the other side. This article was an adaptation of a post written by Lori Batcheller. Click the link if you wish to view the original article. Click here to check out our services and begin living your life to its fullest potential!